Deformulation involves formulating a product by starting with the already finished competitive product and working backwards – conducting reverse engineering through laboratory testing and analysis. Determining the contents of foods and supplements. 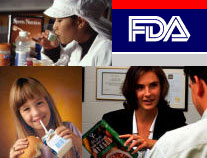 Identifying what has been added to food products or supplements.. Determining the contents and sources of flavors, scents, ingredients, and preservatives used in the food, beverage, and supplementl industries. Determining why the competition’s products have longer shelf lives. Determining the contents of synthetic, commercial, and home concoctions/remedies. Identifying how a product has become "new and improved." Establishing how to make your own products or improve on an existing product..
A multi-level program for laboratory testing and laboratory analysis can be developed with clients to maximize budget dollars. Main components and/or trace level additives can be replicated in various stages to allow the clients to verify performance or try their own ideas. © 1993-2019 NutriData All rights reserved.